Description: D&H GP38-2 #221 (ex-7315) in E. Binghamton yd. Title: A Eastbound double stack train climbs Attica Hill with Guilford (DH) and BAR units for power. Description: For a late afternoon northbound, there were not too many decently lit shots going north. One that worked was this view at Afton, where there was enough angle to shoot from the shoulder of NY 7. We see a PLMT rolling toward the signal at GR behind a mix of power. Description: The signal gantry at GR is well known, and easy to get a shot of, due to being so close to the road. PLMT rolls up to it as the afternoon rolls on into evening. Description: Slowly at first. This PLMT has quite a power set, and pushers too. It is getting started from Bevier St for a slow trip up to the tunnel. Description: This pair of units was turned by leaving East Binghamton, running up to Bevier St, back to West BD on the Buffalo Runner, and is now headed back to the yard on track 3. Description: This D&H unit was trailing RPPY at Crocker Hill Rd in Port Crane, presumably for dynamic braking, but it may also just be a pusher being returned to Binghamton. Sometimes a northbound would drop a helper at Afton if there was a southbound coming fairly soon, with that train taking it back down the hill. Description: NYSW 4032 leads an eastbound mixed into Binghamton as WABH-11 makes a run to Vestal on the old DL&W. End of September, exact day unknown. Description: RPPY arrives at East Binghamton behind a pair of NYSW units bracketing a D&H GP 38. It will cut the power off and leave the train to be worked. Description: A front end roster view of newly rebuilt at M-K 7407, one of eight units rebuilt and repainted into the lightning stripe scheme. This unit, along with the other 39s, would go to CSX once CP took over the D&H-I saw one in Ohio on the ex B&O about six years later-but the 38s would last a long while into the CP era. As I write this in 2016, there is still at least one in this scheme. Description: D&H rebuild 7312 leads this 72 car BUME at west Endicott, the first of four D&H units on the train. 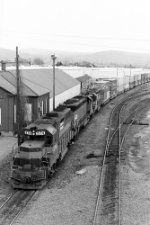 The 7312 was notable for being named in honor of legendary D&H engineer Bernie O'Brien. Description: No longer part of Guilford, northbound Potomic yard to Rouses Point freight at Sanitaria Springs, NY. Description: Train 310 rolls its 60 freight and 7 intermodal along the rocks with an interesting power mix. Description: Train 310 rolls past a barn and field near Rathbone.